I was very excited to be invited to The Merlin School to read some of Tiny Owl’s stories to children! 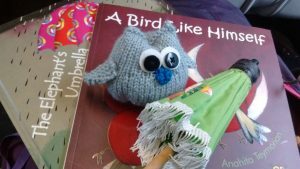 On Tuesday 9 May, I visited four reception classes during their morning lessons to read two Tiny Owl titles: A Bird Like Himself and The Elephant’s Umbrella. I picked these stories because they’re full of the joys of sharing and helping each other, which children are just learning for themselves at this age. Each class was a joy to visit; the children were full of enthusiasm, and everyone joined in to spot the animals, guess what happened next, and make an amazing range of animal noises! We played a game after each book – I passed round a toy bird or a toy umbrella, and each person who got to hold it had to pick an animal, make a great noise, and decide either how that animal would help Baby to fly, or whether they would keep or share the umbrella. All the children were very keen to talk about the ideas in the books, and had some really good suggestions about why sharing is important and why it’s good to help each other. They also had plenty to teach me about animals! Thank you to The Merlin School for making me feel so welcome; I hope everyone enjoyed themselves as much as I did. We’d love to bring our books to your school too. If you’re interested in an event, please email info@tinyowl.co.uk.